Are you the type that looks forward to that hot, fresh cup of coffee in the morning? Does it tend to give you that pick-me-up that you need to get your day started? Maybe you’re the type that enjoys many cups of java a day, seeing it as more of an experience than just a beverage you drink to quench your thirst. While there’s certainly nothing wrong with grabbing a cup of coffee at a coffee shop, it can get pretty pricey over time and it’s not always convenient. This is exactly why so many coffee drinkers choose to own a coffee machine in their home, and even in their workplace. Coffee makers have come a long way over the last few years, providing even more features and convenience than ever before. While you may not be in the market for all the bells and whistles, there are some key ones you may want to be on the hunt for. Here, we’ll take a look at the top tips, advice, and information that will help you pick the best coffee maker for your needs. Do You Want a Traditional Coffee Maker or Something More High-End? What About the Brewing Temperature? Does the Coffee Maker Have a Good Quality Water Filtration System? For some people, the whole point of buying a coffee maker is to be able to make a fresh and high-quality cup of coffee right at home. If that’s the case, then the standard coffee maker probably isn’t going to do the trick. 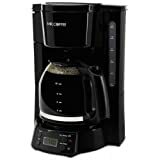 Instead, you may need a coffee maker that is more high-end with features such as the ability to grind coffee beans. Freshly ground beans can intensify the flavor and make it seem more like something you’d get in a fancy café. As for what the best coffee maker with grinder is, there are a number of factors that contribute to the answer. 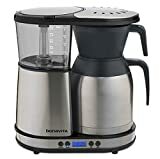 This includes such things as the budget, the functions on the machine, how big it is and if you have the space for it, whether it can brew one or two cups at a time, and exactly what kind of grinder it offers, as there are different types. Probably the biggest downfall with these more high-end, almost commercial grade machines is the fact they do take up so much space. You’ll see them in coffee shops and even in some office break rooms, but you need to have the space for them. Another question to ask yourself is how many cups of coffee the coffee maker needs to be able to make at once. Today, the single-serve machines are all the rage, but that doesn’t mean that brewing a pot is over and done with. Those who drink a lot of coffee or have a few coffee drinkers in the house may prefer being able to brew a full pot at once. These pots tend to hold anywhere from eight to 12 cups, depending on the model. Even if you live in a house with multiple coffee drinkers, the pot may not be the way to go, depending on the type of coffee you enjoy. Let’s say, for example, one person likes flavored coffee, another likes dark roast, then there is a decaf lover. In that case, the single cup brewers make more sense, as everyone can pick exactly what they want. One feature that you may want to consider is the automatic timer feature. This feature will turn your coffee maker on and start brewing a coffee for you. If your coffee maker is Wi-Fi enabled, then you may also be able to download an app that lets you control it. The automatic timer ensures that when you come stumbling into the kitchen early in the morning, you’ll be greeted with the smell of freshly brewed coffee and a hot steaming cup waiting for you. While on the topic of automatic features, you may also want to look for a machine that has an automatic shut off. Most people are in a big rush to get out the door in the morning, so it’s nice to know that you don’t have to worry about turning off the machine before you go. Speaking of a steaming hot cup of coffee, that is another thing you will want to consider. Check to see if the machine you are interested in allows you to change the brewing temperature. The ideal pot of coffee should be brewed at 91◦C to 96◦C. Brewing it between this temperature range allows for the best flavor to come out. If the machine can’t reach these temperatures, then the taste of the coffee will suffer. There is a lot of focus on the features and what the coffee will taste like, but it’s also worth considering how easy it is to clean it. You probably won’t need to be cleaning it on a regular daily basis, but it should be easy enough to clean the water tank/holder, the carafe (if there is one), and other components of the coffee maker. Making sure you clean it on a regular basis will help the coffee to taste its best and prolong the lifespan of the machine. The final tip will also have an impact on the flavor of your coffee. Making sure the machine has a high-quality water filtration system will ensure you don’t end up with funny tasting coffee. Sometimes, water can have a high concentration of iron or other elements, which can then alter the taste of your coffee. When you have a good quality filtration system, it will remove these elements and flavors and ensure your cup of coffee tastes incredible. By keeping these tips in mind as you search for the perfect coffee maker, you’ll be able to find one that fits your space constraints, your wish list, and your coffee drinking preferences. 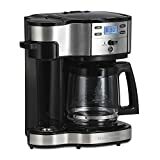 You can find the best coffee maker for the best price on Amazon.